Barbara Yager is one of three Baba Yagas living in the United States. Having been a baba yaga for so long, Barbara no longer considers herself to be human. When not fulfilling her duties, Barbara lives with Chudo-Yudo a dragon who has become a dog, to make himself more palatable to the human population. Ivan has been stalking Barbara for three days, trying to work up the courage to speak to her but tired of waiting, Barbara takes the bull by the horns and approaches him. It seems that the Baba Yaga before her gave Ivan's family a magical promise of aid due to his grandmother's bravery and love. With his children taken from his custody and justice system wrongly convinced that he abuses his children, Ivan is forced to turn to the Baba Yaga for help. It seems that a human named Johnathon Billingwood has developed the ability to influence people and has not only stolen Ivan's wife away but blocked Ivan's access to his children. Considering the circumstances, Barbara feels she must absolutely become involved. Wickedly Magical is a prequel of the Baba Yaga series and coming in at 67 pages, it's a short story absolutely designed to interest the reader in the series. 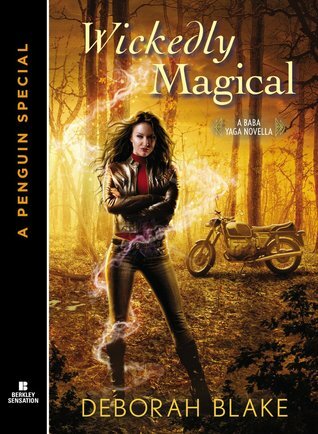 As an introduction to the Baba Yaga series, Wickedly Magical more than does it's job. I finished Wickedly Magical very quickly and am absolutely anxious to see where this story is going to go. Blake took great care to update some of the folklore associated with the Baba Yaga to make it fit within modern times. All of the Baba Yagas still live very secluded lives but they no longer fly around in a mortar with a pestle. Barbara's mortar and pestle now takes the form of a motorcycle. Their homes are all still made from the original chicken leg hut but have been changed to things like jet streams. Baba Yagas can still change their appearance at will and though Barbara very much presents as an average woman, she still has a bit of a long nose. Each Baba Yaga is trained by the previous one. It seems that because the Baba Yagas are so removed from their humanity by the time they train their successor, this incarnation of Baba Yagas have some unresolved issues. Though the Baba Yagas are not blood related and have been selected to the current roles due to innate magic, they have a very strong sisterly bond and enjoy spending time together. I love that they lean on each other and get a strong sense of family from them. These women however remain isolated because of who they are and don't form relationships with human men. The antagonist in this case is Johnathon Billingwood, and he is naturally charismatic. After finding a magical artifact, Billingwood is able to convince people to do things that they otherwise wouldn't do. An old childless couple is convinced to give up their home to him. People donate money they don't have to his cult. He specifically targets women with children because he wants to have the family he feels he was denied growing up in foster care. To some degree, the Baba Yaga's empathise with him because their childhood was also lacking but at the end of the day, Johnathon must be stopped. There is also the issue that the Queen of the Otherworld, a figure even Baba Yaga's are cautious with, will not be pleased to learn that a human has been using an Otherworld artifact. Barbara acts to right a wrong and to protect herself. As fitting for a Baba Yaga, Barbara is suitably cranky. She also has a penchant for turning people into frogs. I like that she took the time to investigate, and use a disguise to investigate Billingwood. I loved her dragon/dog Chudo-Yudo, who acted more like the pit bull he appeared to be than the actual dragon he is. There's something amusing about a dragon begging for one more s'more. Their interactions were really fun and I cannot wait to see more of Chudo-Yudo in particular. Barbara did display a little of the maternal figure that Baba Yagas are occasionally known for when she acted in the best interest of Ivan's children. Wickedly Magical did end with a small cliffhanger and it was clearly an enticement for readers to pick up the first book in the series. I'm normally annoyed with books which end in a cliffhanger but because all of the issues raised in Wickedly Magical were resolved and the purpose of Wickedly Magical is simply to introduce the world to readers, I'm fine with it in this case. In terms of inclusion, Wickedly Magical has none. All of the characters are decidedly white and many were either Russian, or of Russian descent. Because this is a Baba Yaga story, I can understand why Blake wrote it this way but the fact that Blake has the Baba Yagas living in the United States should absolutely mean that people of colour appear somewhere down the line in this series. Wickedly Magical is also completely straight. This is something I hope will change as the series progresses. There are no marginalized characters to speak of whatsoever. Given that this is just an introductory novella, I really hope that this is not a sign of things to come because thus far, Blake has really hooked me. I want more of this world. I want to know exactly how the magic works and what other supernatural creatures Blake will involve. I want to see more of the relationship between the sisters develop even more. The Baba Yaga series is wicked with potential and I look forward to going for the ride.